Cloudy and damp with rain early...then becoming partly cloudy. Low near 50F. Winds NW at 10 to 20 mph. Chance of rain 90%..
Cloudy and damp with rain early...then becoming partly cloudy. Low near 50F. Winds NW at 10 to 20 mph. Chance of rain 90%. Under the “Brentwood Bound” plan, measures would be taken to reduce acreage currently located within the floodplain along Manchester Road. 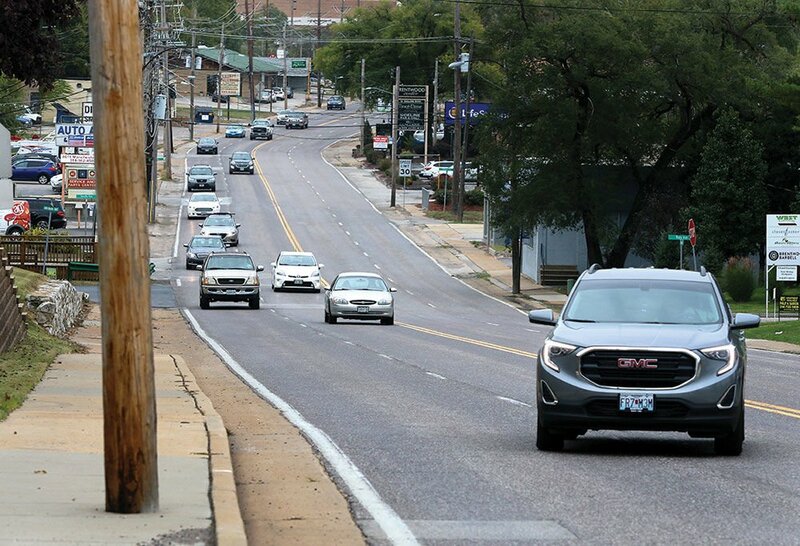 Brentwood officials plan a pedestrian tunnel, decorative street signs, new street lights, trailheads, wider sidewalks and a shared use path on the south side of Manchester Road. Manchester Road turned into a river during a flash flood on Dec. 26, 2015. Removing Brentwood’s portion of Manchester Road from the 100-year floodplain is the goal of a new, $74.5 million infrastructure improvement project with planned execution during 2019 to 2022. Affected properties are adjacent to flood-prone Deer Creek, including 10 residential lots, but none are expected to have to permanently relocate. To field questions and get feedback, Brentwood Bound Task Force members scheduled two open houses at the Brentwood School District Conference Center, 1201 Hanley Industrial Court. One has already been held, but the final open house is on Saturday, Nov. 3, from 9 a.m. to noon. Residents also can fill out an online survey at www.surveymonkey.com/r/brentwoodbound. Proposed measures would reduce acreage that’s in the local floodplain from 60 to 27, which experts indicate will adequately handle storm water volume. Brentwood Mayor Chris Thornton said aldermen approved these revitalization projects, starting in May 2017, with hopes of overcoming long-term flood challenges that impact a quarter of the city every two to three years. Records show Brentwood received 11 damaging floods since 2000. Thornton said this initiative dovetails fantastically with 2019 being Brentwood’s centennial year. Working with Jacobs Engineering Group and CH2M consultants, Thornton said officials also designed the planned retention areas carefully so flooding is not pushed downstream. Being a physicist, he added he believes the project’s gravity and water flow factors are well modeled. “Brentwood Bound is an ambitious plan to transform our city for decades to come, and to improve public safety and public health,” said Brentwood Alderman Steve Lochmoeller. Bola Akande, Brentwood city administrator, said the initiative is a great opportunity for the community to benefit from multiple capital infrastructure projects, and to cultivate an enhanced regional destination. Brentwood Bound will be funded through a combination of grants, partnerships, funding from certificates of participation, and a possible one half-cent economic development sales tax that would require a vote among residents, said Brentwood Communications Manager Janet Vigen Levy. Pledged project funds are through various entities: Great Rivers Greenway $3 million; Missouri Department of Transportation $540,195; a MODOT cost-share grant of $3,858,667; and an East West Gateway anticipated STP (Surface Transportation Program) grant of $1.2 million. Akande said other grants may be secured through the St. Louis Economic Development, Missouri Sewer District, Charter, Ameren and Verizon. The project is slated to be completed in two phases, with the first zeroing in on flood mitigation and the second focusing on creating a Deer Creek Greenway Connector. Phase 1 is meant to address 70 percent of flooding issues by widening and stabilizing the creek’s stream bank, and by improving the profile and slopes of nearby land. It also will enhance the 1.5-mile Manchester Corridor between Hanley and Bremerton by improving drainage and sidewalks, including Americans With Disability Act features. The Manchester Road bridge will be replaced near Hanley Road, and the traffic signals will be upgraded. 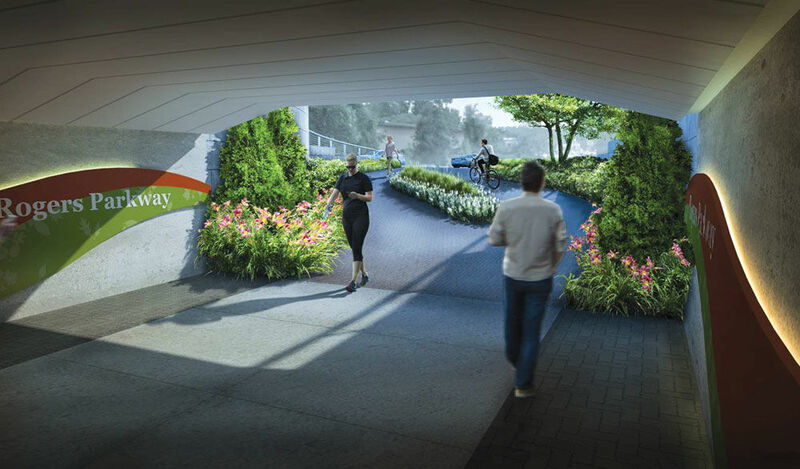 Brentwood officials also planned a pedestrian tunnel, decorative street signs, new street lights, trailheads and accessible curbs plus wider sidewalks and a shared use path on the south side of Manchester Road. Chris Hoglan, store manager for The Tile Shop, said their store will not have to move during any phases. “The main entrance is all that may affect us, hopefully not too negatively. So far, the communication has been good with letting me know of any plans or time frames to be aware of,” he added. In the project’s second phase, the Great Rivers Greenway’s Deer Creek area will be aligned with Rogers Parkway, and remaining flood-related concerns will be addressed. Thornton said they look forward to working with Maplewood, Rock Hill, Webster Groves and Shrewsbury “renaissance” representatives to update and streamline that stretch of Manchester. He reminds that a fresh, developable land strip along a popular corridor will be created from the acres taken from the flood plain..